On March 23rd, 1933, the Berlin Reichstag could not be used because of the fire which had damaged it badly a few days before. Therefore, the parliamentary session took place at the Kroll Opera House. The Nazis wanted the Enabling Act to pass, which would give them the kind of power they were looking for. Adolf Hitler, who spoke in front of the lawmakers for the first time that day, even threatened the opposition by saying the representatives should decide whether they wanted peace or war. Most opposition parties agreed to the Enabling Act. By doing so, they put their stamp on the end of democracy. One single party, the Social Democrats, refused to agree. Their chairman Otto Wels went to the podium. “You can take our freedom and our lives, but not our honor”, he said while the Nazis laughed. “No Enabling Act will give you the power to destroy ideas which are eternal and indestructible”, Wels stated. These were the last free statements in parliament before evil and darkness would reign for 12 years. And it was the finest hour of the German Social Democratic Party, the SPD. On December 7th, 1970, thirty-seven and a half years after Wels’ speech, and twenty-five and a half years after General Jodl had declared Nazi Germany’s unconditional surrender, the first Social Democratic Chancellor of the Federal Republic of Germany, Willy Brandt, was in Warsaw. At the Monument to the Heroes of the Warsaw Ghetto, Brandt went down on his knees, to the surprise of everyone there, including the members of his own entourage. Reporters took pictures of this impressive moment which would go down in history as the Warsaw Genuflection. This gesture, by the head of government of the nation which had brought death, terror and plight to Europe just a quarter century before, was a heart-felt and sincere apology. Brandt’s Warsaw Genuflection also contributed to an easing of the tensions between the Soviet Bloc and the West, at least to a certain extent. Forty-seven years ago, Brandt even got the Nobel Peace Prize for his policy of reconciliation, especially with the East. On top of that, it was the finest hour of the SPD, again. 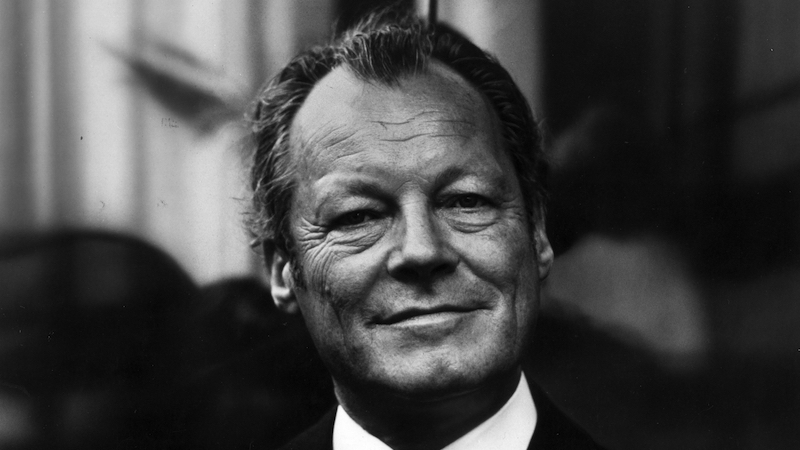 To many, including the participants of the 1968 student revolution, Willy Brandt was just the right person to take over, the first more progressive Chancellor. “We want to dare more democracy” is what he had announced right after being elected by the Bundestag. Helmut Schmidt, Brandt’s very capable Minister of Finance and a representative of the more conservative wing within the SPD, had to take over after Brandt stepped down because Günter Giullaume, his right hand, turned out to be an Eastern German agent. Schmidt had to deal with the Soviet Bloc’s military buildup and America’s answer. Even though that position was not popular at all in his party, he defended NATO’s Double-Track Decision and told hundreds of thousands of peace protesters they were wrong. Also radical left-wing terrorism was something Schmidt was confronted with as Chancellor. When Palestinian terrorists hijacked a Lufthansa jet with tourists between Palma de Mallorca and Frankfurt, and murdered its pilot in an attempt to obtain the release of Baader Meinhof Gang members from German jails, Schmidt was steadfast. He did not give in, but had an elite police unit kill most of the terrorists and free all hostages during an operation in Mogadishu. Again, it was the finest hour of the SPD. The German conservatives tried to beat the SPD in elections. They sent Rainer Barzel, who lost big-time. They sent the controversial ultra-conservative Franz-Josef Strauss (Strauß) from Bavaria. He lost too. But in 1982, the CDU under Helmut Kohl got Schmidt in a no-confidence vote, since his coalition partner, the liberal FDP, changed horses. On October 1st, 1982, Schmidt congratulated the new Chancellor Helmut Kohl. After 16 long years of Kohl’s conservative approach, it happened again. This time Gerhard Schröder formed a coalition with the Green Party. Like Schmidt, Schröder was not that popular with his party’s left wing. Neither was his Green Foreign Minister Joschka Fischer, in his own party. When this center-left coalition approved military action in former Yugoslavia and refurbished the “social welfare state” of Germany, because it had to be done, his popularity did not exactly increase. But Schröder, a strong personality, pulled the strings he needed to pull. He appeared on TV while comforting residents of flooded villages. And he won again. There was no finest hour though. In 2005, Angela Merkel had already moved her party CDU to the left, closer towards the political center. And, since neither her nor the SPD had first choice coalition partners strong enough to support a government, they formed a grand coalition. The SPD was Merkel’s junior partner. During that time, the Social Democrats did contribute to Berlin’s policies a lot, but somehow nobody noticed. It was Angela Merkel, the moderate CDU politician, who got all the glory. This means the SPD was rolled like pastry, then fried, eaten and digested. At least that was what the party felt like when the numbers started dropping. After four years in the opposition, the SPD formed another grand coalition as Merkel’s junior partner. This time things would be better, they thought. But again the party of August Bebel, the founder, of Otto Wels, Willy Brandt and Helmut Schmidt was sucked dry by vampires. When Merkel was done with them, the Social Democrats were even weaker, and they pledged not to agree to any more grand coalitions. Chairman Sigmar Gabriel, who had taken over the big post at the Foreign Ministry in the second grand coalition for a year, since his predecessor Steinmeier became President, did not exactly cause popularity boosts either, especially while talking to his friends in Tehran. Their new hope, Martin Schulz, who had been called home from Brussels, was supposed to fix things. But during the election campaign his numbers slumped after an initial high. Again, the SPD suffered a crushing defeat. Anyway, Schulz rejected talks with Merkel. But, a year ago, there was a problem. Mrs. Merkel’s friends of the FDP aborted their coalition talks with her, for reasons hardly anyone understands until today. Suddenly the SPD was under pressure to save the country again. Schulz said no. Then President Frank-Walter Steinmeier, an SPD politician, told Schulz to try. So Schulz said yes. But when he suddenly wanted to become Foreign Minister under Merkel, shortly after saying he would not be available for any grand coalition, he had a credibility problem and needed to go. 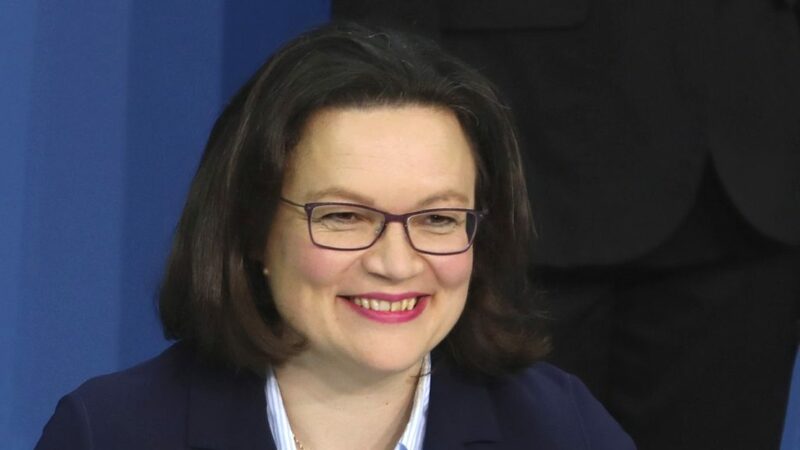 That was the moment when the first female leader, Andrea Nahles, took over. She is running the party and its parliamentary group in the Bundestag. Nahles, a Catholic single mother and former Minister of Labor, is in her late forties. She is smart and has the potential to appeal to both wings within her party, but she is also unpopular. 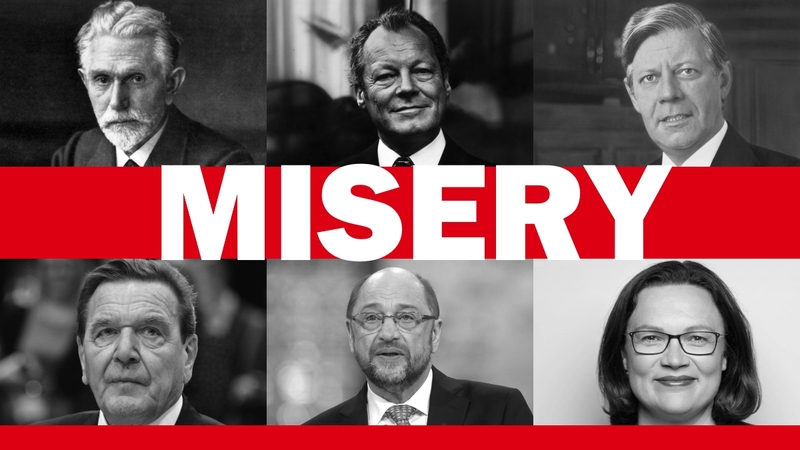 Today, the SPD is still being pulverized by everyone, including former voters, who do not see or want to see the party’s successes, by Angela Merkel who still seems to be trying to be the “better Social Democrat”, by The Left (‘Die Linke’) and even by the far right. The numbers provided in the latest polls are nothing less than catastrophic. At the recent Bavarian federal state elections, the party got only 9.7 percent, less than half they had received in the last elections. The Social Democrats are now only the fifth-strongest political force in Bavaria’s state parliament. Can it even get any worse? On the national level, the 20.5 percent the SPD got last year were seen as a big tragedy and the biggest blow ever. Now they stand at around 17 percent, meaning from today’s perspective those 20.5 percent do not look so bad, in comparison. Another problem is that the AfD is stronger than the SPD, according to the latest polls mentioned in German-language media. Now everyone has advice for the SPD. Some say the party should concentrate on itself instead of bashing its coalition partners CDU and CSU for staging the most embarrassing dispute about migration policies. Others say the SPD should bash its coalition partners more. And there are those who just do not know what to say anymore. The left wing within the party wants an immediate strategy change, meaning some insist on opening up towards ‘Die Linke’, in order to try to build a left-wing coalition on the federal level. Being the only party which opposed Hitler’s Enabling Act does not lead to success anymore. Remembering the other finest hours doesn’t either. The SPD, a former big-tent party, is drowning. And, at this stage, nobody seems to be able to prevent it. This is a rapid descent during which the pilot will have to start pulling the control yoke back and run the engines at full throttle. The time is now.